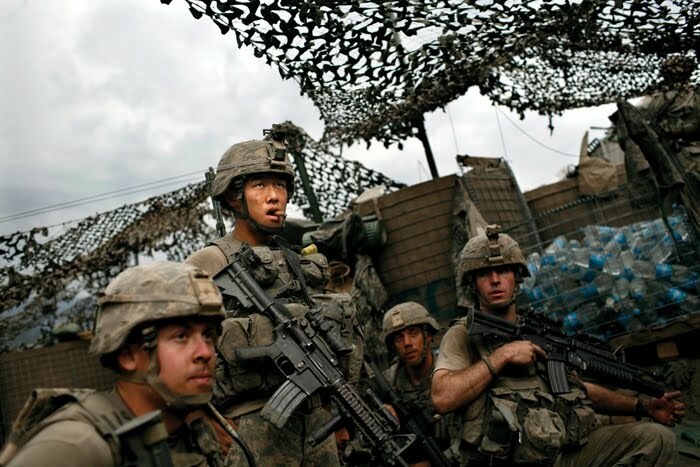 Tim Hetherington and Sebastian Junger's film "Restrepo" has been nominated for an Academy Award for Best Documentary. Starting in 2007, the two producers repeatedly embedded with an active-duty platoon of U.S. soldiers in Afghanistan's Korengal Valley, in Kunar Province. The film is a gritty companion to Hethertington's book "Infidel," a thoughtful collection of photos and images, and Junger's "War," an insightful exploration of what makes men fight, and what fighting does to men. The books were previously reviewed on the Red Bull Rising blog here. In June 2010, the producers graciously provided a limited number of soldiers of 2nd Brigade Combat Team (B.C.T. ), 34th Infantry "Red Bull" Division (2-34th BCT) an exclusive opportunity to screen the film before its theatrical release, while the unit was preparing for deployment to Eastern Afghanistan. Some Red Bull soldiers have since found themselves walking mountainous terrain similar to that depicted in Restrepo. And, although not part of the Red Bull deployment, members of the Iowa National Guard's 734th Agribusiness Development Team (A.D.T.) are currently based in Kunar Province. In yet another Iowa connection, recent Medal of Honor recipient U.S. Army Staff Sgt. Salvatore Giunta was featured in Hetherington and Junger's coverage. Giunta was born in Clinton, Iowa, and grew up in Cedar Rapids and Hiawatha. Following yesterday's Academy Awards nominations, the Restrepo producers made this statement via the movie's Facebook page. While the nomination is a recognition of the movie, we hope it's a fitting tribute to those who have fought and died in places like Afghanistan and Iraq. We made this movie because we wanted to bring the war into people's living rooms back home. We hope the nomination will continue to promote an open and constructive dialogue about the war. Thanks again for all your continued support in making the movie a success. The film will be rebroadcast on the National Geographic channel on Feb. 2, 2011. According to news reports, Hetherington and Junger plan to return to Afghanistan on assignment in April. Sherpa, there was another young man by the name of Scott Kesterson that set out to do a similar project of "visual storytelling" back in spring of 2009. But has since not updated his blog site, even though it still stands. Do you know what has become of him? I saw Restrepo on the NG channel and it was pretty gritty, but an excellent view of what some soldiers are going through. Any idea what became of Mr. Kesterson? Good prompt! I remember reaching out to the press contact regarding "At War" last year, but not hearing anything back. Didn't follow-up at the time, but realize that Kesterson and I now have mutual friends! Plus, he's a former citizen-soldier himself. I looks like his contact with the Big World is sporadic, but I'll see what I can find out. Thanks again for the suggestion--I'd look forward not only to (finally) seeing his film, but also asking him a few questions about how to get around Afghanistan! Other film-related note: On Salon.com, I saw one snarky reaction to the Academy Award nomination of "Restrepo" that also mentioned "The Tillman Story." I'm not sure that the latter got as much theatrical play as the Hetherington/Junger project, but I am looking forward to getting my hands on a copy after it's released on DVD next month! Restrepo was an incredible film. Thanks for the heads up that The Tillman Story is coming on DVD - I haven't seen that yet, so I'm putting it on my must-watch list today. not to steal any thunder from restrepo, but wow i just got my copy of Infidel by tim hetherington, its in a alot of ways the companion peice to the movie, but wow- its an incredible collection of art, photos, and info that is just very ver unique. For those who don't get the National Geographic channel, RESTREPO also available on Netflix as a DVD or streaming.